When you decorate your home's interior with accent chairs, you are either adding style to a disregarded space of a room or infusing some charm into some furnished areas that will otherwise look bland. Perhaps what needs pepping up is an empty section along a hallway's wall, a reading corner in the family room, around the 3-seater leather sofa in the living room, or in the bedroom, right by the nightstand. Wherever you place an accent chair or two, you can be assured that it will always accentuate and spotlight the room in an aesthetically pleasing way. Rather than perceive them as just a couple more extra seating, these single chairs must be appreciated as additional home decor pieces that enhance any furniture they are placed around, and any space (or zone) they are set in. 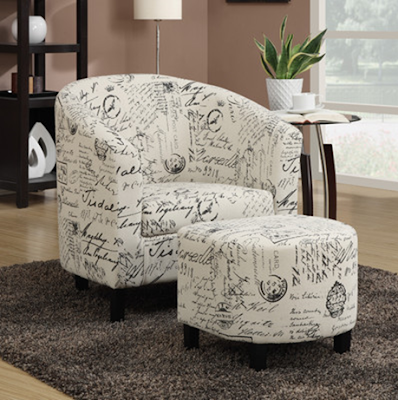 This accent chair is set up with a pouffe (or footstool) and is best used as a standalone pair. The set can be set up in a cosy corner in the living area where you can curl up and read a book, or in the bedroom. 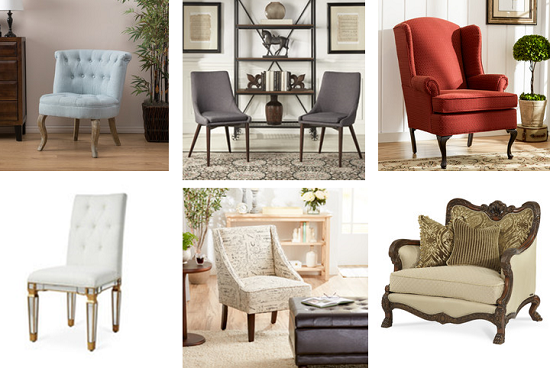 So, what ways can you use accent chairs and how do you know the best style chair to choose? And how do you use them to complement a space? For instance, should they be placed directly in front of your sofa or to its left or right side or should you use a bench-style accent chair against the long hallway wall? Additionally, how do you know when it’s best to use just one accent chair, or if it is better to use them as a pair? How you decorate with accent chairs depends on a combination of the overall look you wish to achieve and where you intend to place them. Also, depending on the general style of your interior space - is it modern, traditional, classic, or eclectic, it is good to ensure you choose one that's the right scale in comparison to other furniture items it will be placed around. The size/area of the zone within which it will be placed must also be considered. Seating area for 2 using accent furniture. The above image shows the set up at the foot of the bed. This arrangement using 2 chairs can be also be placed in the living room to create a second seating area, a foyer, if you have one spacious enough, or by a fireplace. The style you select must be complementary to space, and so must the choice of colour, texture, and pattern. Ensuring all these shouldn't pose much of a challenge and you can always go with your 'gut feeling'. The good thing is that there is no hard and fast rule about how furniture accents should be chosen and placed so its good to know that these stylish single chairs, with or without arms, can be used just about most areas of the home. Best rules to follow are to first ensure you pick the right patterns. If your sofa is a solid colour you can enhance it with accent chairs in bold patterns and prints. A room that is lack-lustre will need some spicing up and the best way to ‘zing-up’ a dull room is by adding patterned accent chairs. 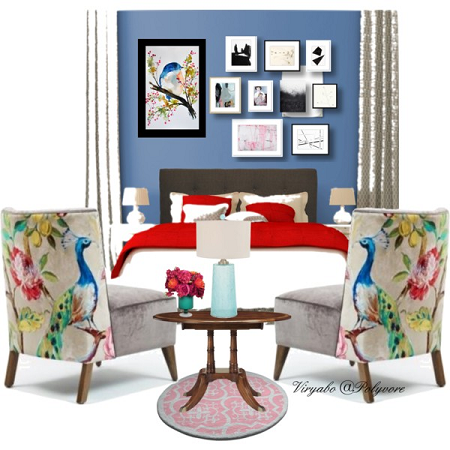 Next is the style, which must not be too divergent from the style of the rest of the room. 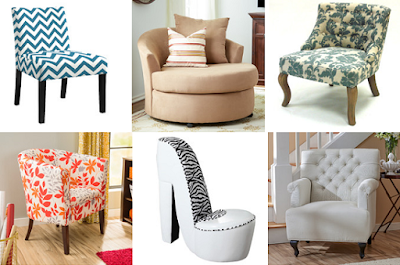 Pick the right style that compliments your other furniture. You’ll need to decide whether it should be a recliner which works well in a contemporary setting, wing chairs if you have classic style furniture or slipper chairs that can transform your home décor setting into something out of the Victorian era. Finally, you must pick the right kind of material with the right kind of texture. If your sofa is upholstered with leather, for instance, your accent chairs can be colour coordinated velvet, damask, cotton, or wool. The best kinds of materials to use for upholstery are natural fabrics but it is good to note that they are not as durable as synthetic man-made textiles though most decorators who prefer natural fibres often select them for their attractiveness and luxurious comfort. Man-made synthetic fabrics used for upholstery are harder-wearing but for whatever purpose the chair is meant for, durability is generally a top concern for most individuals. It’s true that furniture pieces can often be expensive but because you want something stylish doesn’t mean you want to compromise on sturdiness. So to find a great style that matches your budget, you may need to check out online outlets. Online stores have hundreds of accent chairs to choose from. No physical store can give you such a vast selection to choose from. With such large inventories found in shops on the internet, you’ll ultimately find an accent chair that will fit within your budget and at the same time still satisfies your personal taste.